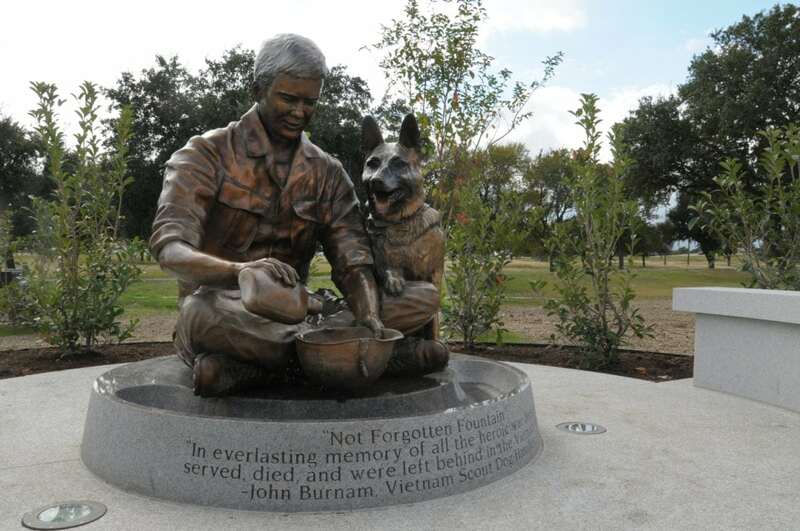 Ron Aiello, president of the non-profit U.S. War Dog Association, estimates that American military working dogs conservatively saved over 10,000 lives in Vietnam alone, and that number likely doubled or tripled in Iraq and Afghanistan. The number of human lives saved by dogs over the years, impossible to calculate, but easily hundreds of thousands. 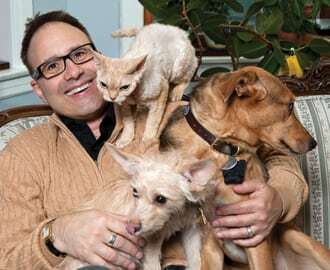 Aiello was himself in Vietnam when his partner, a German Shepherd named Stormy, alerted him to impending dangerTop of FormBottom of Form. Aiello heeded the warning and moments later, a sniper opened fire, just missing him. “My dog saved my life more than once, and most handlers say the same thing,” Aiello says. After partnering with Clipper for about a year, Burnam returned home in 1968. The Department of Defense classifies military working dogs as equipment. 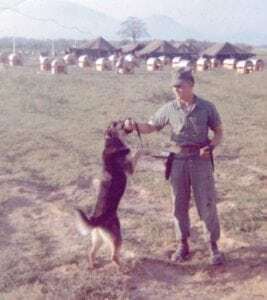 Lots of equipment was left behind in Vietnam to be used by the South Vietnamese military instead of spending money to bring it back, including the dogs. While some dogs did work for the South Vietnamese military, most were euthanized (and not necessarily in a humane manner). “I don’t really know what happened to Clipper, but I suspect he was euthanized,” Burnam says. Today, dogs working for the military are supposed to be retired to civilian life following their service to our country. “It’s the way it should be,” Burnam adds. It’s the way it should be, not always the way it is. 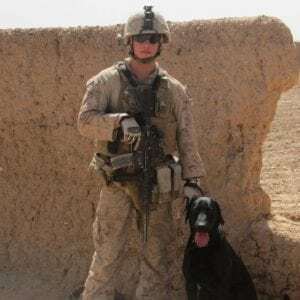 A 2000 bill signed by President Bill Clinton requires all military working dogs suitable for adoption to be available for placement after their retirement. Because working military dogs are highly trained, fiercely loyal, and may have unique medical issues, all retired dogs available for adoption go to the Department of Defense Military Working Dog Adoption Program. Over 300 dogs are adopted through the program each year. Canine service to our country began during World War I. Although there was no official program back then, dogs were used by the military. The most famous military working dog was a Bull Terrier named Stubby, who repeatedly returned to the front, even after suffering from exposure to gas and wounds from shrapnel. Stubby, a dog that today would be identified as a pit bull, was the most decorated canine war hero ever. Stubby saved hundreds of human lives. 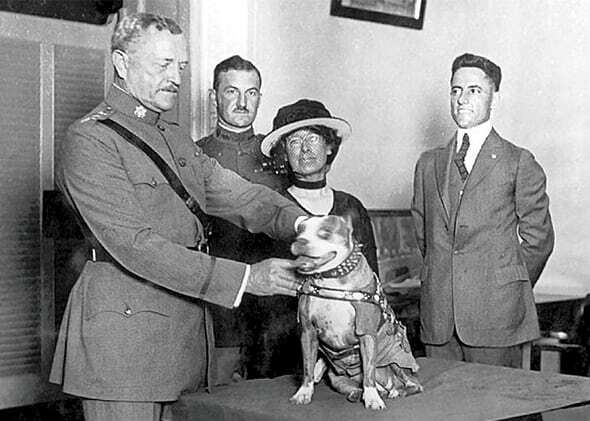 Gen. John J. Pershing awarded a gold medal to “Sgt.Stubby.” The same year, the dog visited the White House to meet President Warren Harding and again in 1924 to meet President Calvin Coolidge. Sgt. Stubby died in 1926 and his remains are preserved at the Smithsonian Institution. 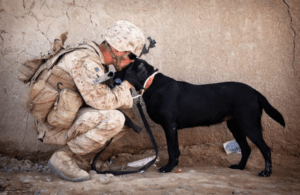 America’s military officially began its working dog program in World War II, and dogs have served our nation in every war (or military action) since, and serve on military bases in the U.S. and around the world every day. All branches of our Armed Forces are utilizing military patrol dogs specializing in drug and bomb detection. 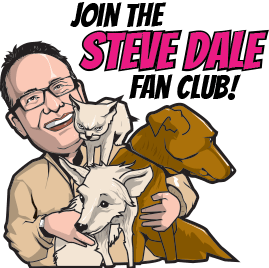 There are approximately 3,000 of these canines stationed around the world with their handlers in Japan, Germany, Kuwait, Afghanistan, Iraq, Saudi Arabia and South Africa to name just a few. These dogs are being used to patrol air bases, military compounds, ammunition depots, military check points, leading patrols and clearing minefields. In addition, dogs on bases (even in the U.S.) serve as guard or watch dogs. Several years ago, a U.S. General was boasted in an interview with me about new million dollar military equipment to assist soldiers to find landmines. Then he added, “No matter what we’re able to do, we can’t duplicate a dog’s nose.” But military working dogs go beyond the mechanics of their nose. working dogs obviously don’t serve for acclaim. 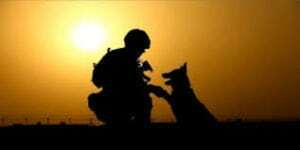 The U.S. War Dog Association began OPERATION MILITARY CARE K-9 began in 2002, an initiative to send care packages to U.S. Military Working dogs and their handlers. Another service is of the U.S. War Dog Association a prescription drug program for former military working dogs, as well as emotional support when dogs pass away.